"I cannot believe how much you managed to teach us in just one day. As many of our students have found, learning to make stained glass can be an engrossing and satisfying hobby, or even a lifestyle business for the really intrepid! 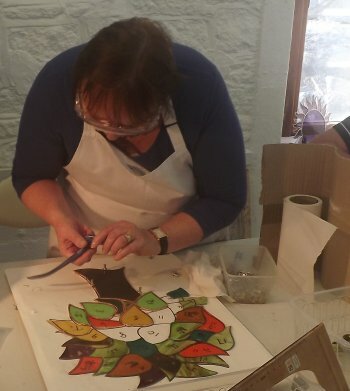 Whether you're a beginner, already have some experience or are looking to get away from it all and spend a week with other likeminded artists at our Cornwall retreat, we invite you to join us on one of our popular and fun creative classes! 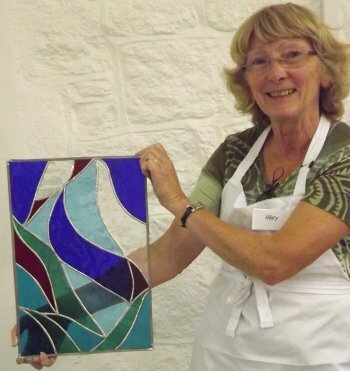 If you've never done any stained glass before, we suggest you begin by looking at our beginners classes and select a date and venue that suits you. The content of all our one-day beginners classes is structured to provide you with a challenge, resulting in a piece you will feel proud of! Both our traditional leading (aka Garden panels) class and our contemporary foiling class are suitable for beginners. Or you could try our Stained Glass Mirror Making class for beginners. If you've tried foiling and want to get to grips with leading, we suggest our Garden panels class as this offers the simplest and quickest way to gain experience of working with lead. If you have a project in mind of your own, our Improvers class is for you and will be tailored around your needs and ambitions. The Stained Glass Mirror Making class also offers new skills in foiling with a practical end result! For something a little different, why not try our new Etching class? You'll learn how to design and etch a simple panel, with the option to create your own etched design - all finished in one day. Requires some drawing ability and glass experience. For a thorough grounding in both construction techniques, plus time spent learning to design for glass, and the chance to experiment with glass etching, we invite you to look at our Cornwall 5-day courses - a great way to become proficient rapidly with guidance on hand throughout the week. We run two 5-day courses each year in Porthleven - April and October. We also run a similar 5-day course at our studio once a year, at Wakefield Country Courtyard, Northants. Find out more about this course here. Our new 2 day course may be the answer! Aimed at those with some experience, join our weekend workshop from Saturday 9-45 to Sunday 6pm and make your own design. 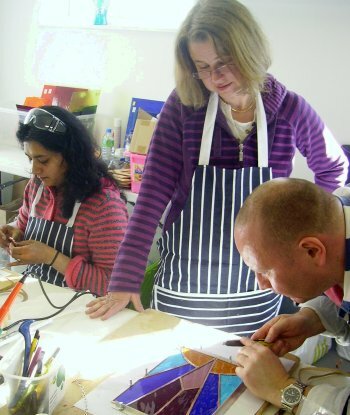 If you've got a larger project in mind find out about our 2 day stained glass course here. Our occasional 1-day classes are idea for those with some experience of making stained glass and who wish to learn to design in the medium. Find out more here! Wakefield is on the A5 2 miles north of Potterspury, 3 miles north of Stony Stratford and about 10 miles from Milton Keynes. Porthleven, near Helston & Penzance. Go to the page for the course or class you want to join - you can find full details of course dates, venues and prices and make your booking online there. If you have any questions about our classes, the booking process or are concerned about your ability to complete a class, do get in touch! "Brilliant! Loved the variety of skills and having [a] complete piece to take home"
"Just to say THANK YOU SO MUCH for a great day with you. Just coming down from being on such a high after the day." "I am delighted with the pieces I made. I suspect my husband actually thought I'd bought them!" "A brilliantly relaxing way to spend a day with something amazing to take away." "…..thank you very much for the tuition you gave last w/end - my stained glass piece is proudly hanging in the front lounge!"